n a world where Dragons roam the land and the heavens, there exists a civilization with extraordinary magical powers. 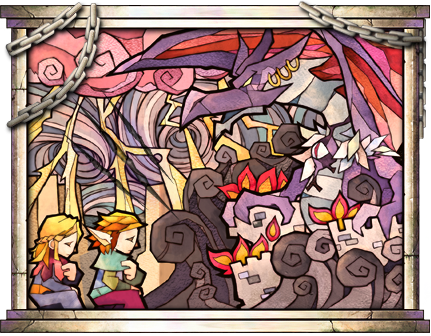 This world, the world of Dragon Saga, will take new adventurers into the discovery of its riches and traditions. Since the close of the Dragon War, dragons and humans lived in peace on separate worlds - humans on their homeland, and dragons exiled to the depths of the Aether. But, peace never had a chance, it seems. Paris, one of the Five Heroes that defeated Elga, in her unending thirst for power, offers a deal to her ancient enemy, Elga. Paris offers her heart in exchange for immortality and everlasting youth. In turn, Elga is promised freedom by Paris. Paris, however, betrays Elga and locks him up in Drakos Tower. Blinded and corrupted by the immense power, Paris launches an attack against her old friends with the Ice Dragon, Kryos, by her side. Starting another bloody war in the world of Dragon Saga. But she underestimated the courage of the heroes of Dragon Fellowship, as Kryos was defeated and Paris was forced to go hiding once again. Now, fuming with her hatred against the Fellowship heroes, she returns to Elga in hopes of gaining a powerful ally. A terrible mistake, it seems, by Paris. Since Elga has been waiting for his moment of revenge ever since he was betrayed by Paris. Filled with interminable rage, and now with Paris’s eternal powers, Elga threatens to end the short-lived tranquility for the heroes. As an old foe makes his return, Dragon Saga heroes gain a valuable ally as well. The Dragonkin race, with far more advanced culture and technology than the rest, comes out of their 1000 year long seclusion to lend our heroes a hand. With new allies and enemies adding fuel to the never-ending struggle, will ‘Peace’ be a forever forgotten word in the world of Dragon Saga...?